“The elephant panel” from the Huqoq synagogue mosaic. Via the Journal of Roman Archeology’s blog. Since 2011, the Huqoq Excavation Project has been excavating a late Roman (fifth century) synagogue in lower Galilee paved with stunning floor mosaics. 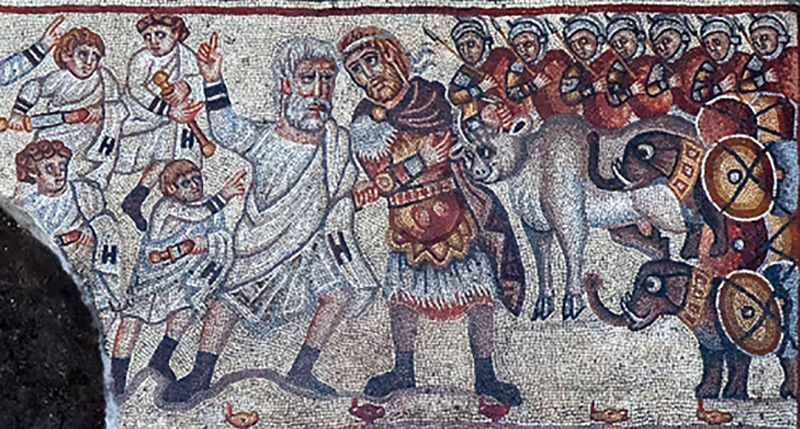 One mosaic in particular, dubbed the “elephant panel,” departs from the usual significant ways from other ancient synagogue mosaics. Rather than depicting a narrative scene from the Hebrew Bible, the panel depicts a striking scene from the Hellenistic period: the bloody defeat of a Greek army by a Judaean force and the subsequent peace treaty between the two sides. In this talk, Huqoq site historian Dr. Ra’anan Boustan will consider what this visual narrative — which juxtaposes conflict with mutual recognition — would have meant to a Jewish community living in the rapidly Christianizing Galilee of late antiquity. This talk is supported by a Royalty Research Fund grant given to Stroum Center faculty member Mika Ahuvia for the 2018-19 academic year. Ra‘anan Boustan is a research scholar in the program in Judaic Studies at Princeton University specializing in the study of ancient Judaism. Boustan completed his B.A. in classics at Brown University in 1994 and received a graduate degree in classics and religious studies (Vrij doctoraal letteren) from the University of Amsterdam. In 2004, he completed his Ph.D. in the Department of Religion at Princeton University. Boustan is the author of “From Martyr to Mystic: Rabbinic Martyrology and the Making of Merkavah Mysticism” (2005) and co-author of “The Elephant Mosaic Panel in the Synagogue at Huqoq: Official Publication and Initial Interpretations” (2017). He has co-edited eight books or special issues of journals and has published his work in leading journals such as Harvard Theological Review, The Jewish Quarterly Review, and Medieval Encounters. He co-edits the journal Jewish Studies Quarterly and is currently the site historian for the Huqoq Excavation Project in Lower Galilee, working with Karen Britt on the mosaics in the Huqoq synagogue.